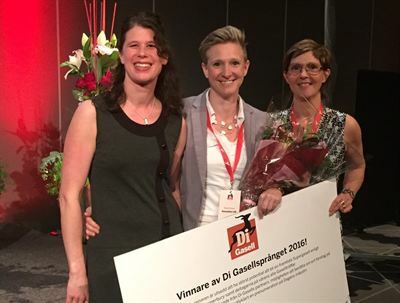 On May 25, SenzaGen was elected winner at the Swedish newspaper Dagens Industri’s event and competition Gasellsprånget, at the national finale in Gothenburg. After a tough round of questions and an audience poll, SenzaGen was elected winner with the greatest market potential and future outlook, leaving the competitor DigiExam a close second. -SenzaGen has great future potential in a new and growing global market. We have been working very hard which makes it particularly rewarding to receive this award and the attention it creates. We are seeing an increased interest in our technology and I am confident that this award will lead to more exciting business opportunities in Europe and globally, says Anki Malmborg Hager, CEO of SenzaGen.